I have been applying to some office jobs recently, which has me daydreaming about office-casual outfits! In particular - nice shoes! I find nice shoes especially difficult in summer time. 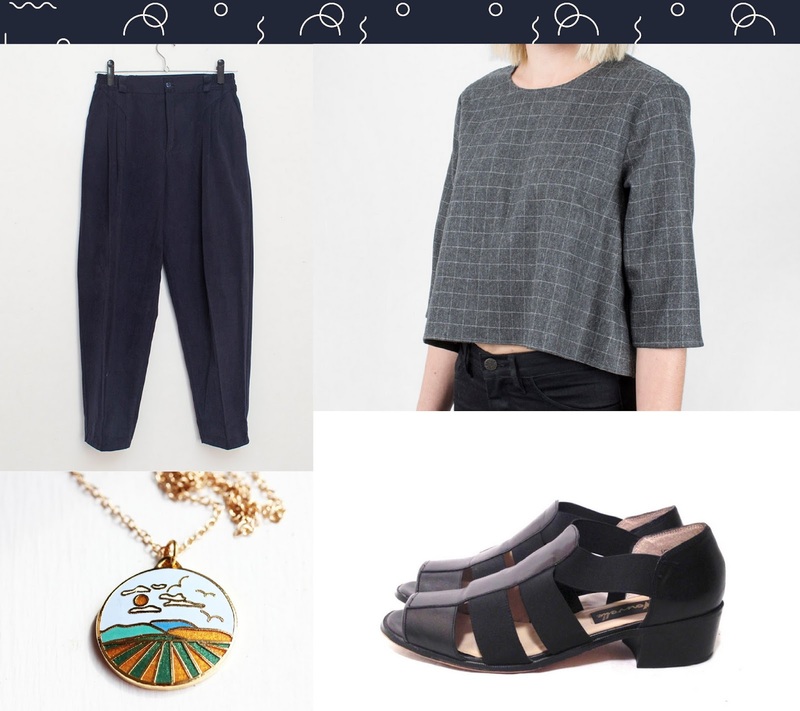 Sandals can look way too casual way too easily, but sometimes with the summer heat they're the only comfortable thing. 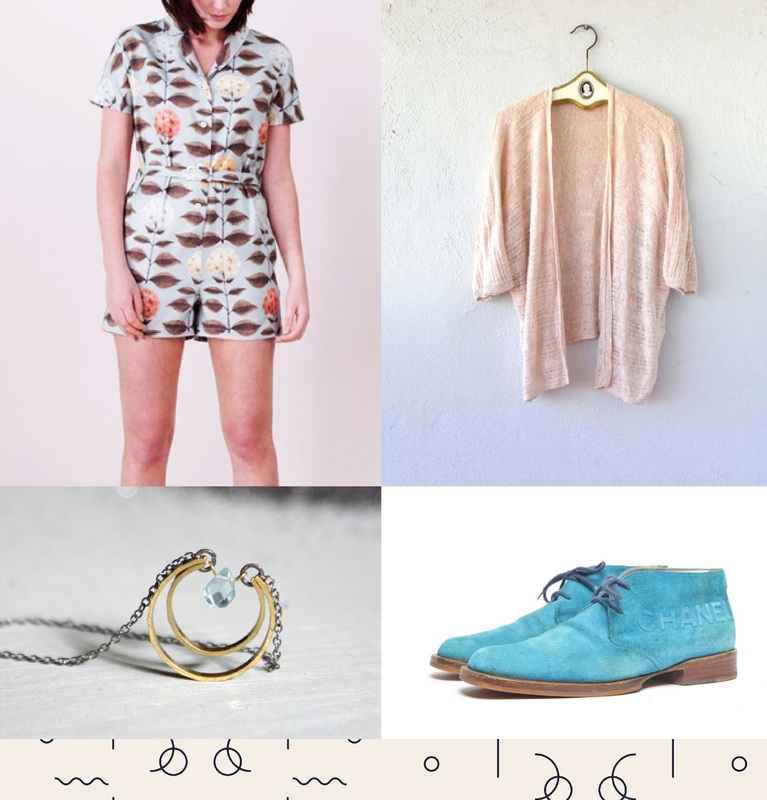 I find jewellery is a fun way to both gussy up an outfit and give it a little bit of personalty! I love the little landscape on this necklace - it's the perfect, subtle, sunshine-y vignette to liven up an all-neutral outfit. What items have you been daydreaming about lately? Today I'd like to share with you some of my art. It is something I wasn't planning on posting much of in this online space but it feels to me like it keeps creeping in anyway - which makes sense, as it is a big part of who I am. 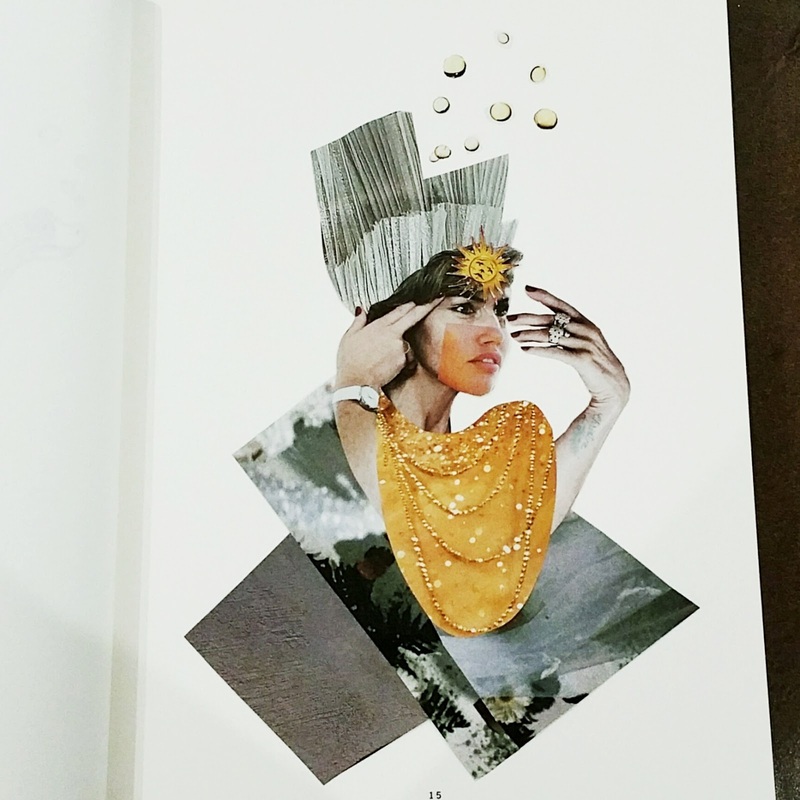 Lately the only art-making that has really satisfied my soul is collage. It is great fun! The top one I made on the computer because I was away from my collection of magazines and bits. The bottom is a hand-cut collage, which I much prefer the process of. I made these two pieces in the last week or so and I thought it was really interesting that they both have really similar colour palettes; with teal blues and golden yellows. It's funny to me because I never set out for a specific scheme or image in my collages - I collect my bits and pieces, sometimes with a vague concept or theme in mind, and see what I find. So to see a consistent colour scheme in my choices is really cool! Anyway. This is my 'Art Fart' for today. I will probably share more on the blog as time goes. When I first began my adventure into all-natural living, I was very worried about deodorant. Moisturizers and hair-care etc. seem incredibly straight-forward when compared to the task of dealing with under-arm funkiness! Especially when it comes to all of the expectations we place on deodorant: long lasting, invisible, smooth, nice smelling... It's no wonder the big-brand ones are packed with nasty chemicals to try and meet these expectations. But with the idea floating around that aluminum is linked with an increased risk of Alzheimers/dementia, I physically cannot bring myself to knowingly put it on my body, ever again. It has been very tough to find a deodorant that actually worked - I think I have gone through 5 unsuccessful ones before this! My last one wasn't so bad, but I had to reapply and ended up keeping it in my purse at all times. It was also a liquid roll-on deodorant, so it would be pretty uncomfortable to put on unless I did so a while before putting on a shirt. I've been a supporter of Sam Wish long before she even dove into body products - she used to be all about the thrifty clothes (a lady after my own heart!). One thing I really love about Sam's products is the way that ingredients and their respective information are listed on her site. It's always really nice to have a proper understanding of what I'm putting on my body. I was eager to try out her deodorant when my last one ran out. I'm SO glad that I did. 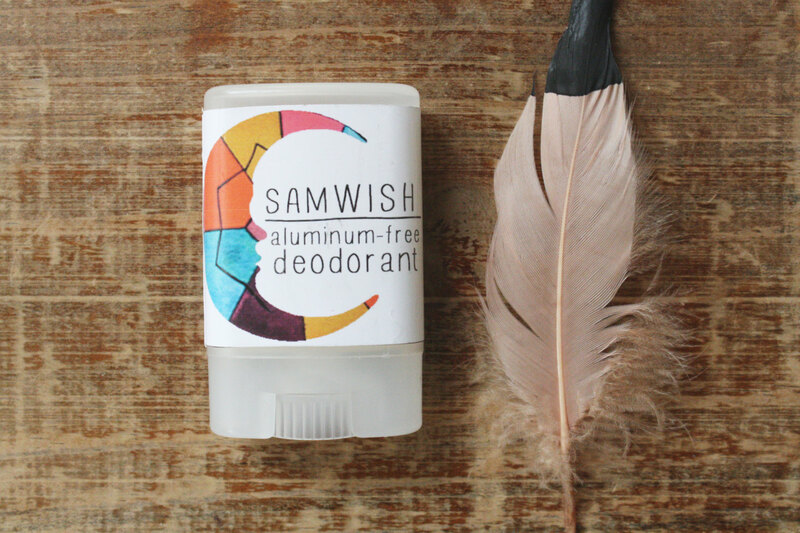 The Sam Wish deodorant is all natural, handmade, organic, AND functional! I ordered the smaller sample size (pictured above) and really wish I had bought a big one - I love it so much! But Sam Wish is located in Texas, so it costs a lot in shipping for me all the way here in Canada. Sadface. I wish I could drop by the various shows and markets Sam does - I highly recommend you do if you're ever in the same area as them! What all-natural/aluminum free deodorants do you use? I would love any recommendation you have! This outfit is made of things I sometimes do not have the courage to wear: loose shorts, and BRIGHT orange! I am so happy that pairing two of these garments together turned out to be the exact way to feel comfortable in them! Check out these linen Wilfred shorts I thrifted a few weeks ago! Score! When I brought them home and tried to wear them though, I was really concerned they'd just look like a giant big-girl diaper... which is, no good. I think I was just wearing them with the wrong thing though, because I have flip flopped back to LOVING them. We have finally had some warm weather here, and they are so perfect for feeling comfortable in the heat! I'll totally settle for the occasional diaper-pant effect just for this comfort. Oh yea. 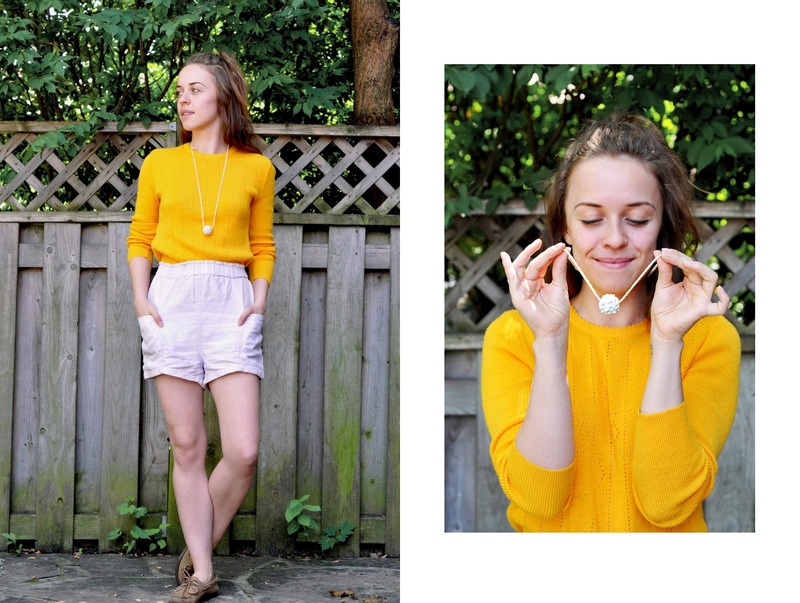 This orange creamsicle sweater was one of my favourite finds from a vintage market back when I was living in Paris. I've been stuck in a neutral loop though - and this sweater has been sitting on the sidelines while I embrace the blacks and whites and beiges of my wardrobe. Summer is the perfect inspiration to break out the bright pops of colour, though, and I'm diggin' the Sunny-D vibe it's giving me. I call this funky necklace my "tumour necklace". It's strange, and bulbous, and bumpy, and weird. But I looove it. I bought it at a little handmade market and am so sad that I can't remember who made it, mostly because they didn't have a business card or website yet. It's a beautiful ceramic piece though, makes me want more ceramic jewellery! Any suggestions? 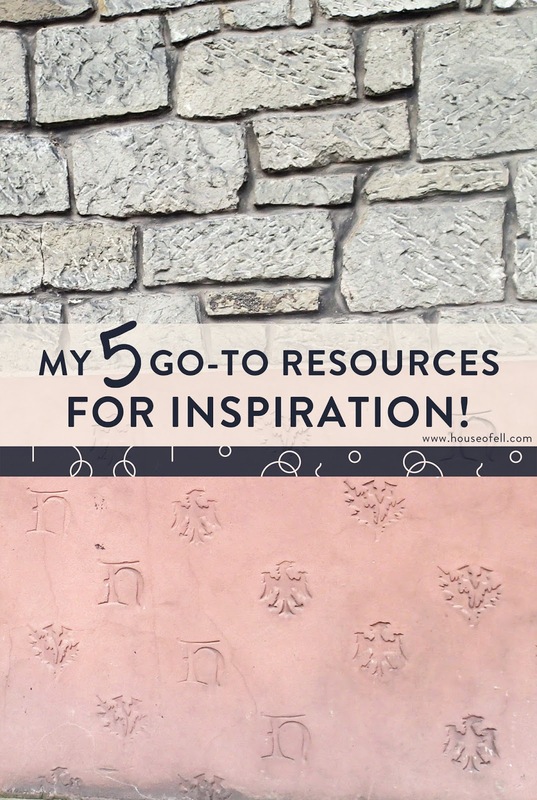 My 5 Go-To Resources for Inspiration! One of my favourite parts of the internet and blogging community is the plethora of available inspiration and resources. There is an endless amount of inspiring content, really, but sometimes it's good to have something to fall back on in case you're having trouble finding something on any particular day. I think this is especially important for those of us figuring out our own paths in life, especially if it's a creative path! Here are my top 5 go-to's for those days where I need an extra push forward! 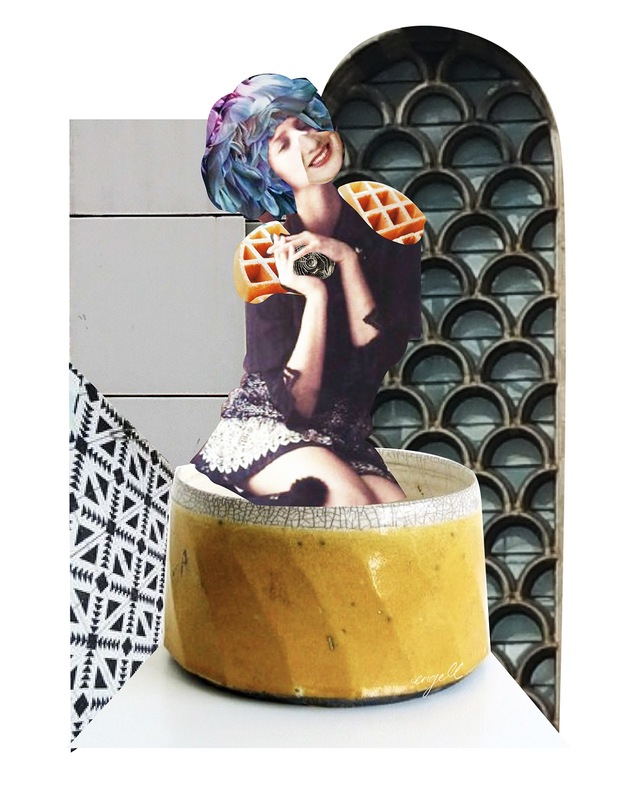 "Be Your Own Muse is a community of creators, entrepreneurs, change-makers and world-shakers." Using a Q&A format, the two editors of this inspiring blog, Kinsey and Sarah, speak with their selection of fabulous 'Muses' to find out more about what they do and what makes them tick! There are some great stories and thoughts on there that I found resonated with me and made me want to kick myself in gear. Jen has some fantastic (fairly) new podcasts on her blog, aimed towards entrepreneurs and bloggers with big dreams. They are really fun to listen to - I've never had much luck getting into podcasts, but I have really enjoyed putting these on and listening to them as I edit photos for work or paint for fun. Topics range from Successful Blogging for your Creative Business to Authentically Building Trust Online. Give it a listen! The What's Underneath Project is a really cool series of interview videos with individuals who strip down - physically and emotionally- and share their journeys with us. There is so much fantastic content about identity, figuring things out, embracing yourself, and personal style. It's got some really touching points and they frequently release little bits on their instagram account, which I follow and love! Though not too frequent, this series on Kaelah's blog is a really fun one to read through. The posts are fascinating little insights into the unique jobs/careers/hobbies of some rad ladies - as the title suggests! It's so fun to see what kinds of jobs are out there that you've maybe never even heard of. 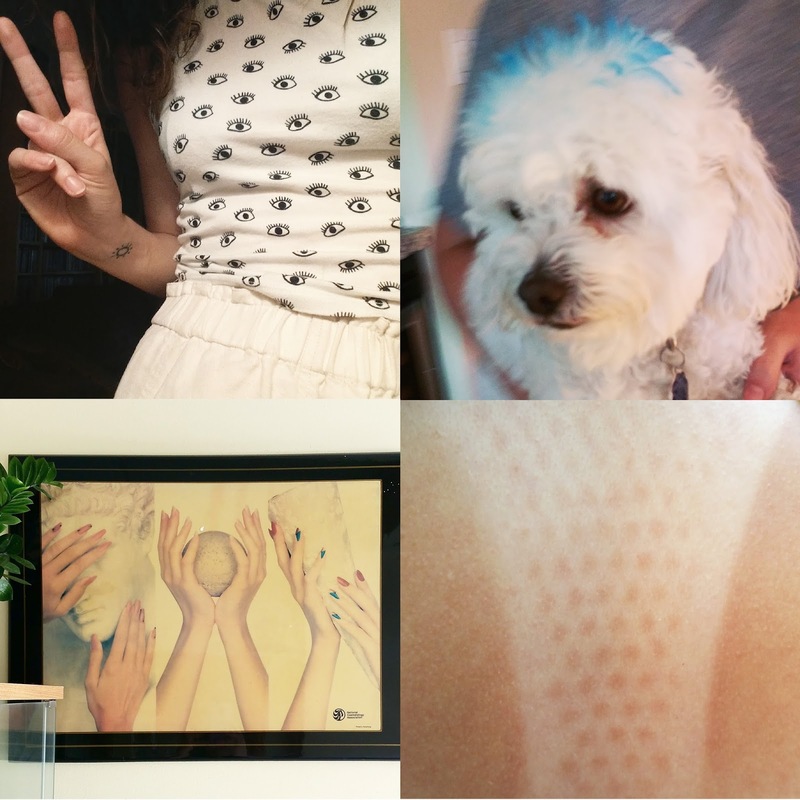 Last but not least, Corina's fabulous Freelance Life series! Sometimes more of an honest post about regarding freelance work, sometimes helpful tips and tricks; the series is a really fun, motivating thing to read as a freelancer or aspiring freelancer. 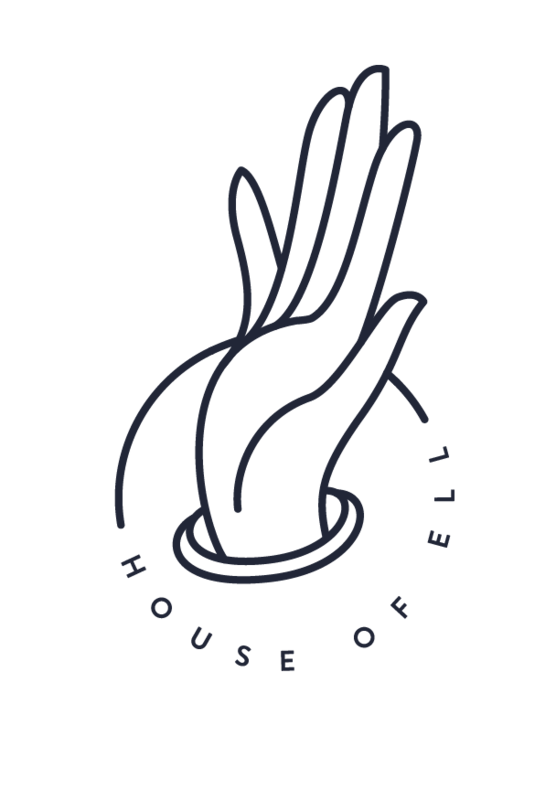 Corina designed the branding for House of Ell, so it's really fun to read her insights on her own process, too, which I can vouch for - it's awesome, and it's awesome to read about too! Not to mention the fabulous graphics she comes up for each post - this lady is endlessly talented! Where do you go to for inspiration for creativity, business knowledge, or otherwise? 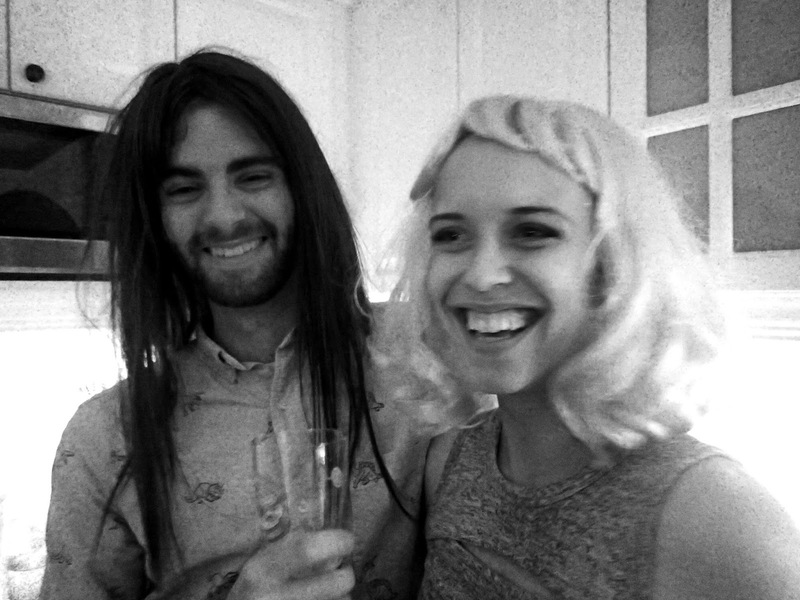 I wanted to share this photo of my fella and I wearing goofy wigs at my graduation party last weekend. It might just be my new favourite of us, in a silly kind of way. And, what better to go with a photo, than the written word, or many written words? So I thought I would also share some thoughts that have been spinning through my head. It is such a beautiful thing to move from one life-phase to another without a need for change in your circle of people or your situation. I always fear that things will get thrown in the air at the junctures of my life; the big transitions. I view these moments as joints in a beam of wood that is really two put together as one. No matter how great of a dove tail or feather you do, a joint is still a weak spot. Making the transition from student to... not, a student, has been a little overwhelming at times and I'm used to these transition phases being a time of re-evaluation: whether on the part of others (about me) or on my part (about others). Right now though, I have such a fantastic set of souls in my life that celebrate the good times with me, take my unnecessarily panicked phone calls in a heartbeat, laugh at all my lame jokes, and listen to me if I need to cry. I am very thankful and happy that this juncture has not shaken my relationships and that my people are in fact, my people. I love them all very much.